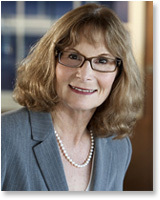 Attorney Elisa R. Zitano has practiced law in the Sacramento area with a varied career that spans over 30 years. Since joining the plaintiffs' bar in 2002, she has provided direct litigation support and assistance in medical, pharmaceutical and medical device litigation, including the Fen-Phen diet drug nationwide class action and the Tenant Healthcare / Redding Medical Center unnecessary cardiac surgery cases. She has also provided research, medical discovery, and lien resolution services in a wide variety of civil litigation including personal injury, medical malpractice, nursing home, asbestos injury and mass tort cases. For 20 years before joining the plaintiffs' bar, she was a partner in the Workers' Compensation firm of Twohy, Darneille & Frye, where she was involved in a busy practice of Workers' Compensation Appeals Board conferences and trials, depositions, and complex medical analysis. Elisa's first career after college was teaching high school English, a profession that she continued even as she attended law school at the University of the Pacific, McGeorge School of Law. Today, she continues to enjoy teaching – but now her students are attorneys. Elisa is known throughout the country as an expert on Medicare lien resolution procedures, having lectured on the subject extensively. She has presented nationwide web seminars and is a frequent lecturer to California trial attorney groups, such as Consumer Attorneys of California (CAOC), Capital City Trial Lawyers Association (CCTLA), San Francisco Trial Lawyers Association (SFTLA), and the Santa Clara County Bar Association. Elisa's lien expertise benefits clients by reducing the amount that must be reimbursed to medical insurance companies. This mean more settlement dollars go directly to the client. While the subject of medical liens may seem to be an unusual topic, the fact is that in recent years, lien resolution has become an important factor in bringing personal injury cases to settlement and final payment. This is critically important to each client, because if medical liens are not handled promptly and properly, settlement dollars that should go to the client end up being paid to medical insurance companies. Elisa's expertise and diligence in resolving medical liens means that clients receive the highest payment from their settlements without having to worry that a medical insurer will demand payment from them personally in the future. Away from the office, Elisa enjoys her home and family. She is passionate about her hobbies which include gourmet cooking, traveling, Italian opera, gardening, and reading history books. She is a fair weather sailor and enjoys taking travel photos. She and law partner David Smith have been married for over 30 years, and are delighted to be involved in the life of their adult daughter.